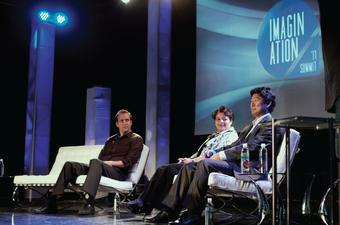 La Mirada looked a bit like Palo Alto on April 15, when the second annual Imagination Summit brought top tech leaders and Silicon Valley innovators to campus to help Biolans brainstorm new ways to enhance education through the use of technology. The daylong summit drew around 600 students, staff, faculty and guests to Sutherland Hall, where speakers gave presentations on new frontiers in wired classrooms, online collaborative learning, mobile learning and more. One of the highlights of the summit included a presentation by Cisco Systems’ Lillie Turner, who gave a demonstration of the new “Show and Share” technology, which allows video content to be searchable and auto-transcribed into multiple languages. Apple’s Jeff Monday spoke about new frontiers in student-generated video learning, while Stanford University’s Paul Kim gave a presentation on the potential impact of education via mobile technology in developing countries. Other speakers included Jason Illian, CEO of ReThink Books, and Maureen Girkins, former CEO and president of Zondervan Publishing, who spoke about the changing face of education as physical books give way to digital content. “The digitization of content is triggering the most innovative time in human history,” said Girkins, who compared the current situation to the era of the printing press, when new technology fueled the rapid spread of knowledge. Chick-fil-A president Dan Cathy also spoke at the summit, sharing the restaurant’s philosophy of going the second mile in serving customers. He shared how the company has innovatively used new media and technology to better provide customer service. At the end of the conference, Crexendo Web marketing services also announced the nine winners of their website contest, giving a total of $25,000 in cash prizes to Biola students. Just saying thanks will not just be adequate, for the phenomenal lucidity in your writing.